At a time when iPads and PlayStations trump books and literature, Aparna Raman, the young founder of Timbuktoo Publishing launches a book for kids written by a group of six to nine-year-olds with engaging text, cute illustrations and pleasing aesthetics. Titled, My Book Of Me, What am I Going To Be Today?, the 34-pager sees the little authors personify different objects and describe themselves in each role. a�?The book would be best described as a role play collective. The roles the kids have chosen to play, tell you something about the personality of each of them,a�? says Raman. The idea popped up during one of Ramana��s many creative writing workshops at Timbuktoo. a�?It was an exercise during one of our sessions. The responses were so interesting, I shared them on Facebook and received fantastic feedback. Thata��s when the idea for a book struck,a�? Raman shares. Imagining themselves as anything from pasta and shoes to snakes and even a safari holiday, the authors paint interesting pictures with words. With its attractive pastel blue background and cute graphics, this book is a great buy to lure your little a��uns down the creative path. Each page has one layer of graphics by the kids themselves, and another by a professional designer. We caught up with the budding authors. Layaa Ananth, 7, an aspiring artist, Vidur Ayappa, 9, who likes cooking, football and rollercoasters. Dhruv Matthan, 6, a die-hard fan of rock music and Def Leppard. 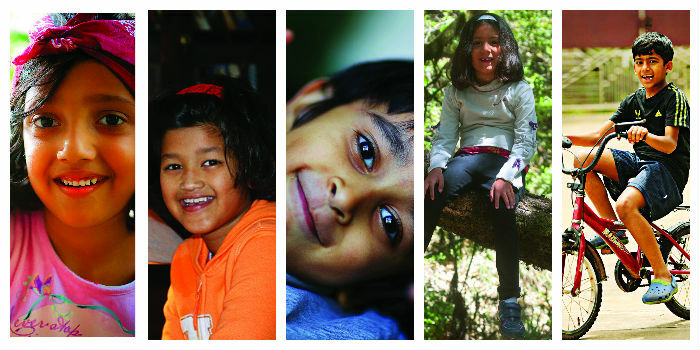 Ranai Rai, 6, an imaginative, intense and an art interpreter, chatty Inaara Nanjappa, 8, an avid reader of Geronimo Stilton and The Famous Five series, Tiya Prince, 7, an artist with a whacky sense of humor and Keya Mammen, 9, active and energetic and quite the tennis buff. a�?I motivate kids to read and write through the joy of seeing their work in print,a�? Raman says. Timbuktoo Publishing, started in March this year, is a company that focuses exclusively on young authors. Apart from publishing books, they also conduct workshops for kids of different age groups. In the pipeline is a collection of write-ups by 9-12-year-olds who attended their Genre Genie workshop. Expected to launch in May next year, the book will focus on writings of specific genres like mystery and adventure. a�?Children are so creative, ita��s like working on an empty slate. Also, knowing youa��re having a positive influence on them is extremely rewarding,a�? Raman concludes.